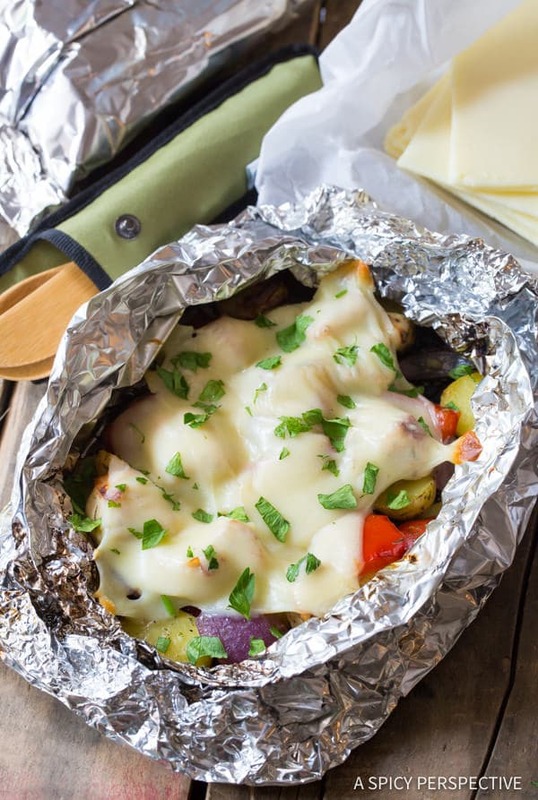 Cheesy Ranch Chicken Potato Foil Packets are a campfire favorite. 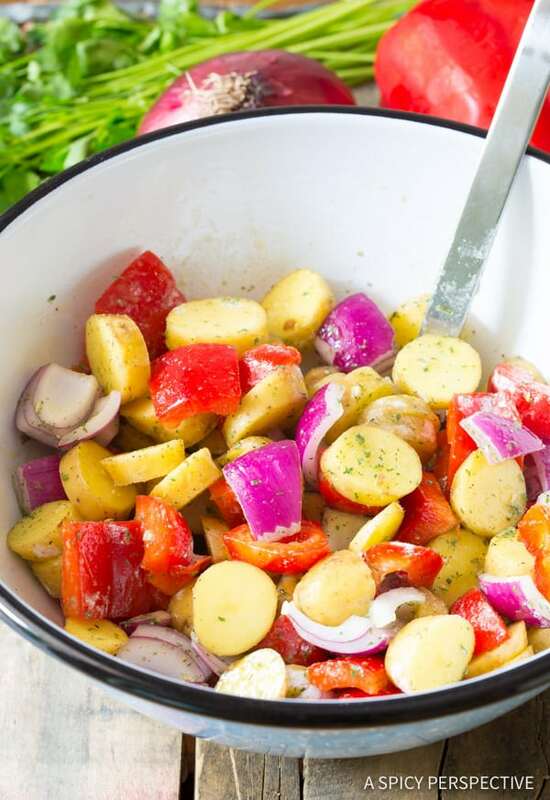 This simple and comforting dinner will keep your campers happy all summer! When Lt. Dan and I first got married we discovered we loved to go backpacking together. We spent all our extra money on cutting-edge water purifiers, tiny gas burning stovetops, super tools with 50 gadgets in one, and all sorts of itty bitty multipurpose backpacking equipment. We would map out a loop through the forest, hopefully crossing a few high points with incredible views. We would make our own camp, pump our own water, and cook dinner in the woods. Then hike back out the next day. These were very fun, and sometimes challenging, adventures. We loved to plan our meals ahead and get everything prepped and ready to fit into our backpacks. That way, we could pull out each meal and cook it over our newly made campfire. 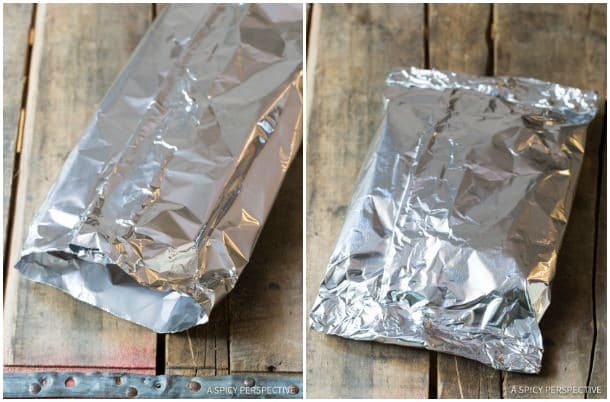 Foil packet dinners were always a big hit. They are easy to prep and store, easy to cook, and fun to eat. The foil acts as both the cooking vessel and the plate. All we needed was our flint to start the fire and our camping utensil multi-tool to spoon it up! After seventeen years of marriage, I’ve softened a little. I still love to hike as often as possible, but I want to come home to my nice soft bed at night. I’ve become a glamper, rather than a serious camper or backpacker. However I still enjoy foil packet dinners and cooking over a campfire. There’s something magical about pulling your dinner out of hot embers, and watching the steam rise out of the packet! 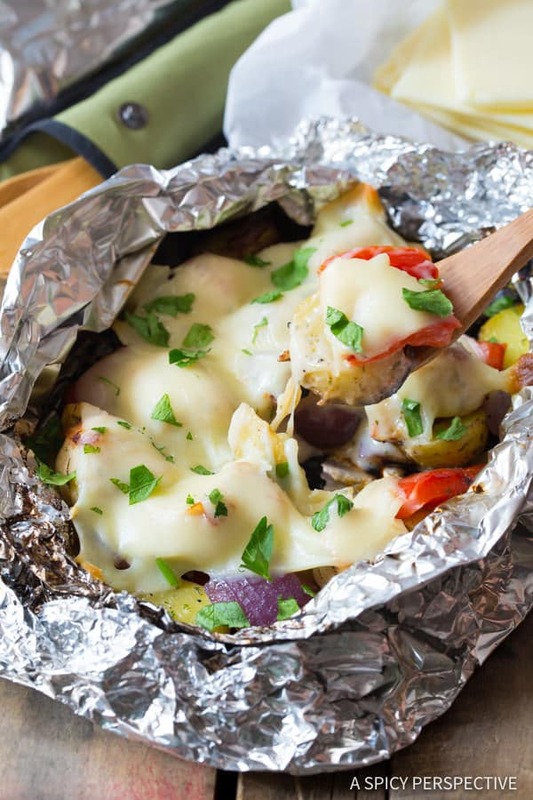 Today I want to share one of my favorite foil packet recipes with you, Cheesy Ranch Chicken Potato Foil Packets. They add some fun to mealtime whether you are backpacking, camping, tailgating, picnicing in the park, or just grilling in the backyard. 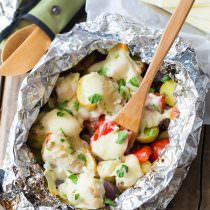 To make Cheesy Ranch Chicken Potato Foil Packets slice potatoes into small rounds so they can cook quickly in a campfire or on the grill. Then toss them with onions, bell peppers, a little oil, and a ranch dip seasoning packet. 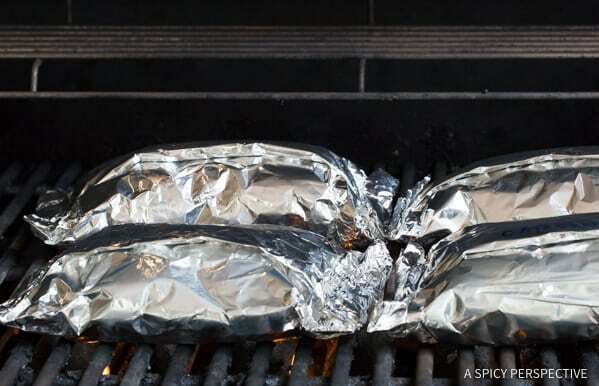 The veggies are divided onto four pieces of foil. Chopped chicken is placed on top. 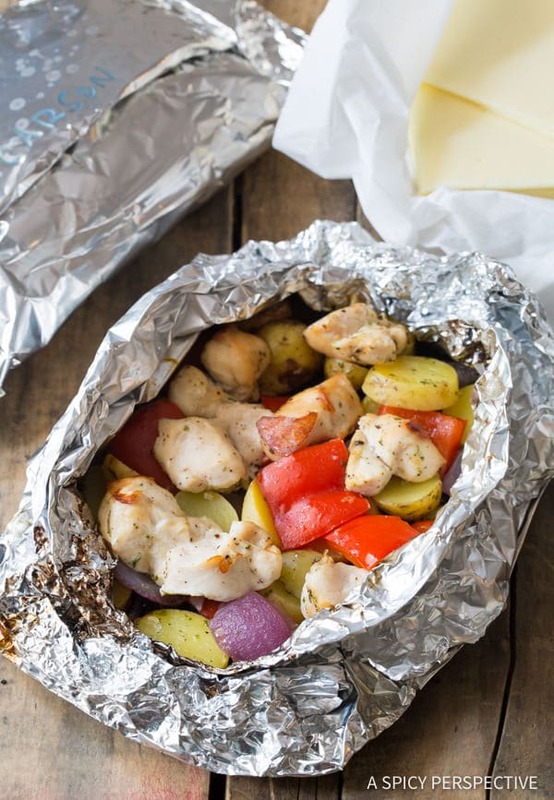 The potatoes need to rest at the bottom of the foil so they cook all the way through, while the chicken benefits from being a little further off the heat. After a few minutes in the flames, open up the Cheesy Ranch Chicken Potato Foil Packets and lay freshly sliced Land O Lakes® White Deli American slices over the chicken and veggies. The Deli American slices melt over the chicken and vegetables creating a cozy creamy dinner that no one can resist. Land O Lakes® Deli American slices elevate outdoor dinners like nothing else! 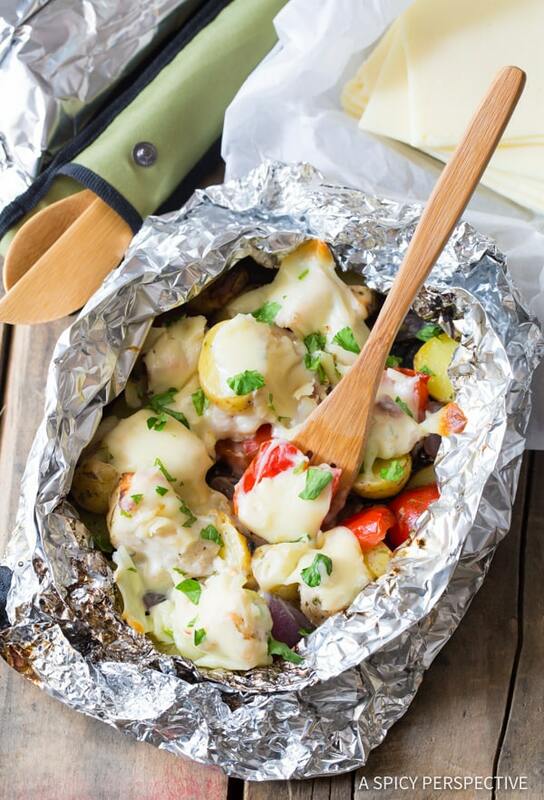 Why not enjoy these Cheesy Ranch Chicken Potato Foil Packets this weekend, whether you are cooking over a campfire or on your back porch. I guarantee they will help you make some memories of your own! 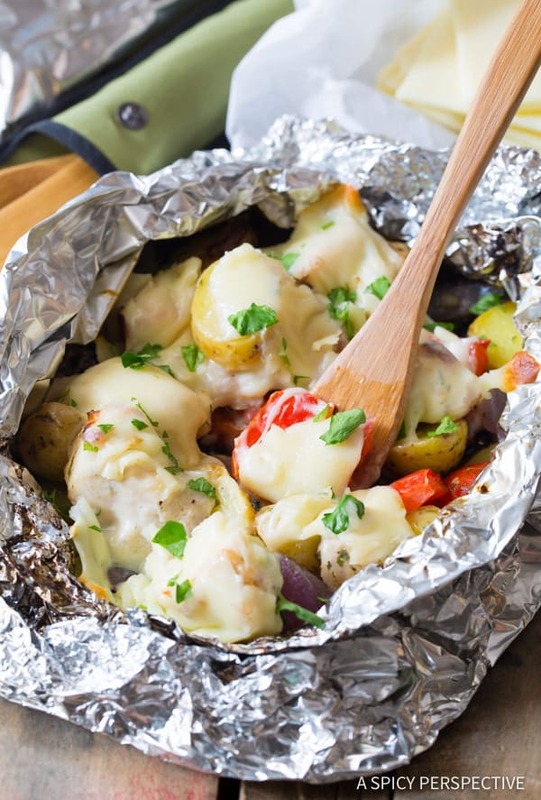 Cheesy Ranch Chicken Potato Foil Packets, a great dinner idea for camping, tailgating, and grilling in the park! 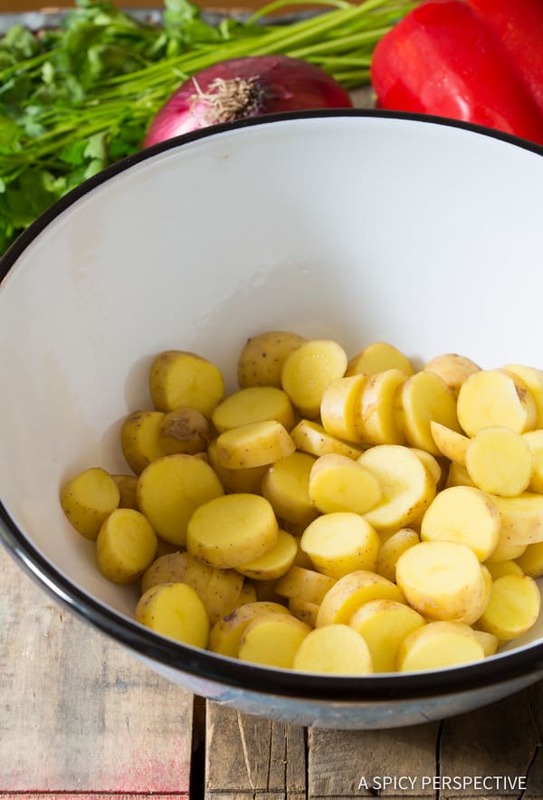 Slice the potatoes into 1/3 inch slices. Cut the bell pepper and peeled onion into 1 inch pieces. 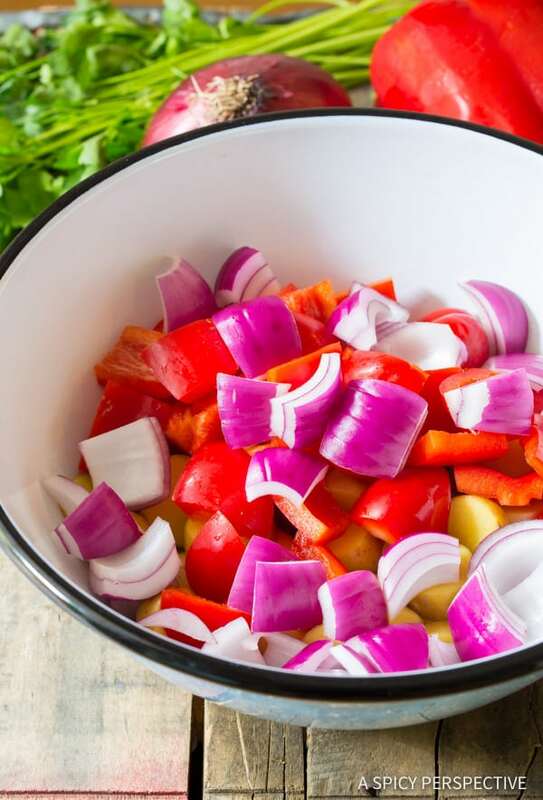 Place the chopped veggies in a bowl. Mix in the olive oil and the ranch seasoning packet. Toss to coat. Lay four 14 X 18 inch pieces of foil out on the counter. 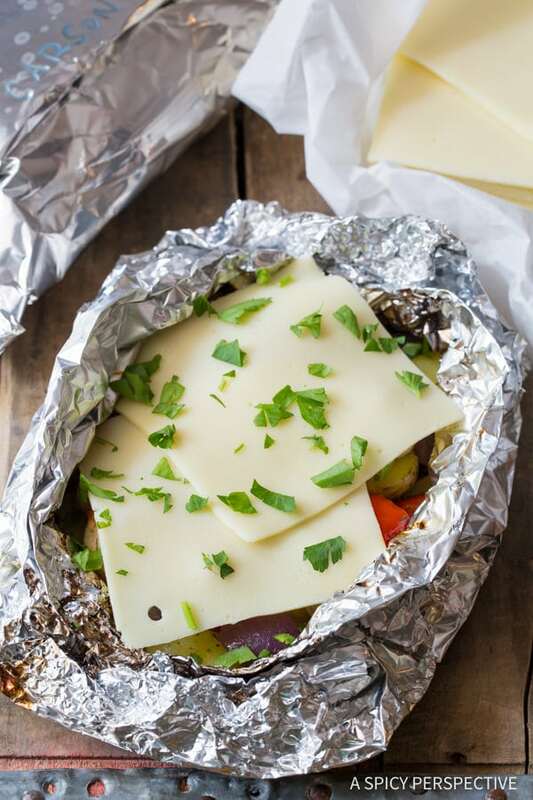 Divide the vegetables evenly between the foil pieces, piling them in the middle of each piece. Chop the chicken into 1 inch chunks. Season liberally with salt and pepper. Then pile the chicken pieces evenly on top of the veggie piles. 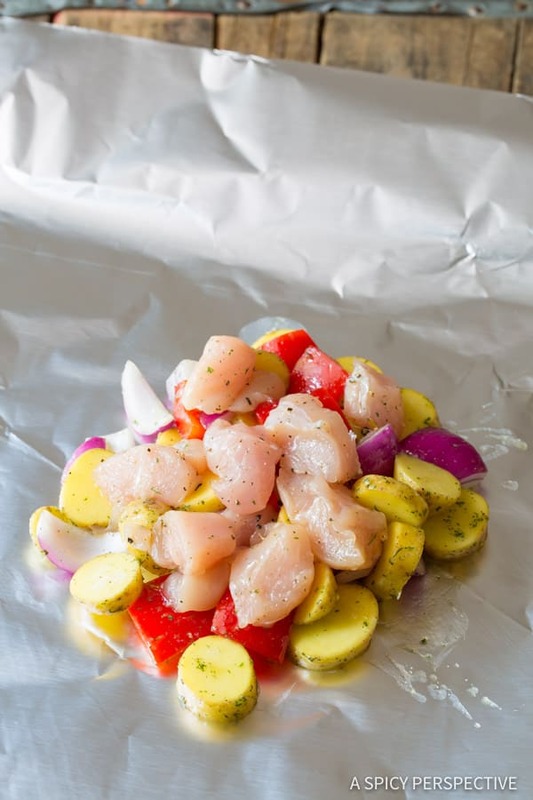 Lift the long ends of the foil over each chicken and vegetable stack and neatly fold them together at least three times, so they stay secure. Then fold the shorter ends toward the center at least three times each, on both sides. The packets should be tightly secured on all sides. 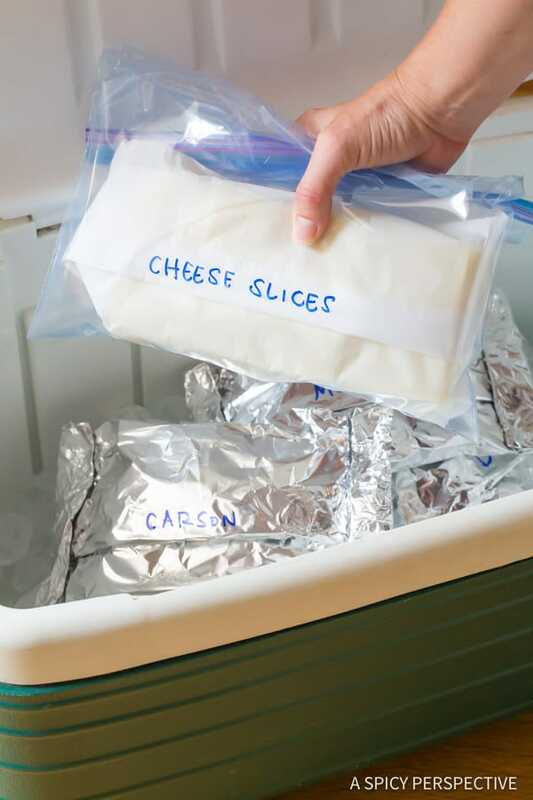 Refrigerate or place in an ice chest until ready to grill. When ready to cook, preheat a grill to high heat, between 500 – 600 degrees. Once hot, place the packets on the grill and cook for 20 minutes. Remove the foil packets with tongs and carefully open them up. Then place two slices of Land O Lakes® White Deli American and a sprinkle of chopped parsley over each packet. Set them back on the grill for 1-2 minutes, just long enough for the cheese to melt. Serve warm! NOTES: We have often taken these packets on overnight backpacking trips to cook over a camp fire. When packing light, you can put the cheese slices and parsley over the top of the chicken prior to cooking. 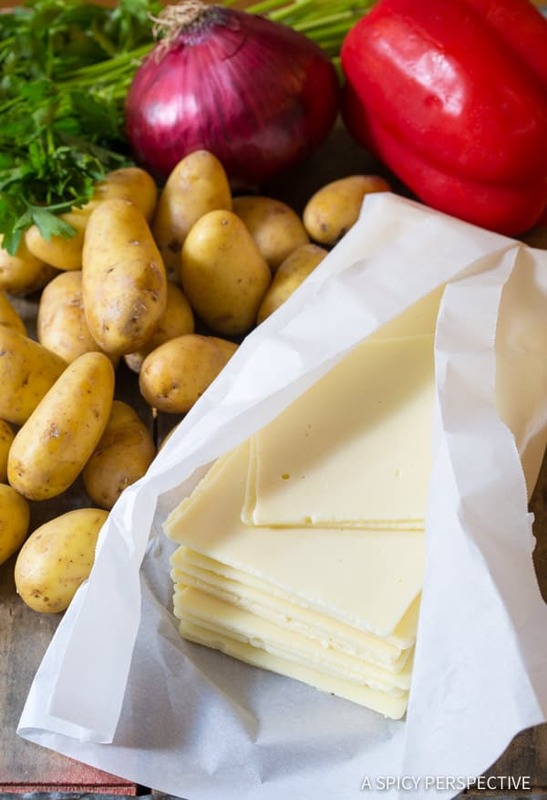 However some of the cheese will stick to the top of the foil when you open them up. Make sure to place all four packets in a large zip bag before storing in your backpack. For campfire cooking: Place the packets down in the hot embers for 15-20 minutes, Remove with tongs (or a long stick.) Open and enjoy! Disclosure: This post is sponsored by Land O’Lakes, Inc. ADD A LITTLE GOOD™ is a trademark of Land O’Lakes, Inc. All opinions are my own.